▲ Judisches Haus in Czernowitz, 2004. 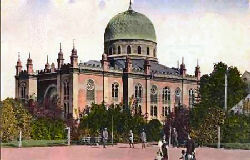 ◄ The Temple at Czernowitz, pre-WWII postcard. Czernowitz was a cosmopolitan city that once had a vibrant Jewish population, at least until the advent of the Second World War. Visit the Museum's online exhibition "Czernowitz: Town With a Jewish Past," as well as follow the Czernowitz/ Bukowina "city tour" that reflects the history of the city and the experience of some of its former Jewish citizens. Enter the WJC Czernowitz exhibition here.